While in Orlando, Tom also worked in Bill Allred’s Good Time Jazz Band at Rosie O’Grady’s at Church Street Station, and with his own vintage rock band, The Terrier Brothers, at the Orchid Garden. The Terrier Brothers assumed duties of relief house band at Lil’ Darlin’s Rock and Roll Palace in Kissimmee, FL where they appeared with the rock and roll legends of the fifties and sixties. During the same time period, Tom also had the unique opportunity to record a progressive rock project with Kansas City based Ancient Vision at Ian Anderson’s (Jethro Tull) studio in Barford-St, Michael, UK . 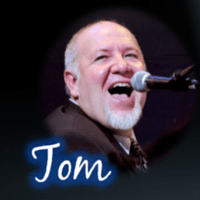 Tom has continued to tour the world with multiple trips to Europe, the Mid-East, South America, Malaysia, and annual trips to Japan with Tom Fischer’s New Orleans All-Stars. He still participates in the West Coast Traditional Jazz Festival circuit, and makes annual trips to British Columbia. He recently co-wrote and starred in the “Big Easy Award”-winning production of “Jump Jive and Wail, the Music of Louis Prima” at the National World War II Museum in New Orleans.